Click on the “Upload Theme” Link. Click on the “Browse” button and navigate to the downloaded “chic.zip” file and click Install Now. After successful Installation of the theme, Click Activate. 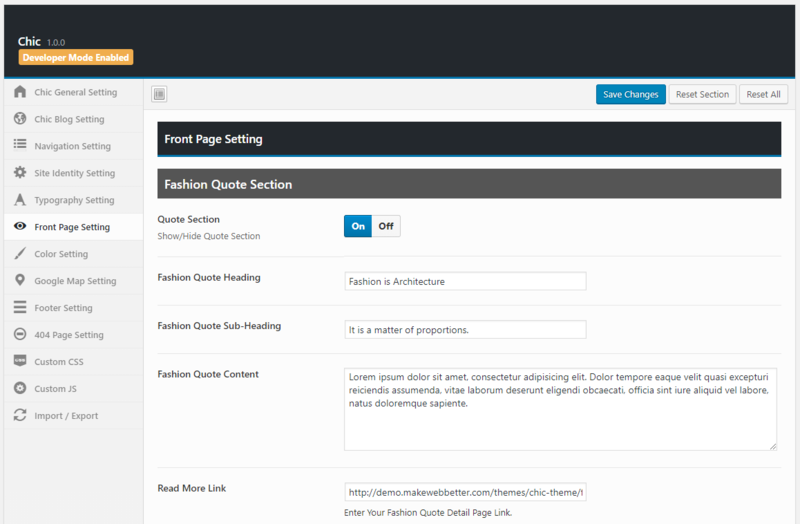 Manual installation of Theme is another option to install Theme to your WordPress-environment. The manual installation method involves downloading our WordPress Theme and uploading it to your web server via your favorite FTP application. 1. Extract the downloaded “chic.zip” file. 2. 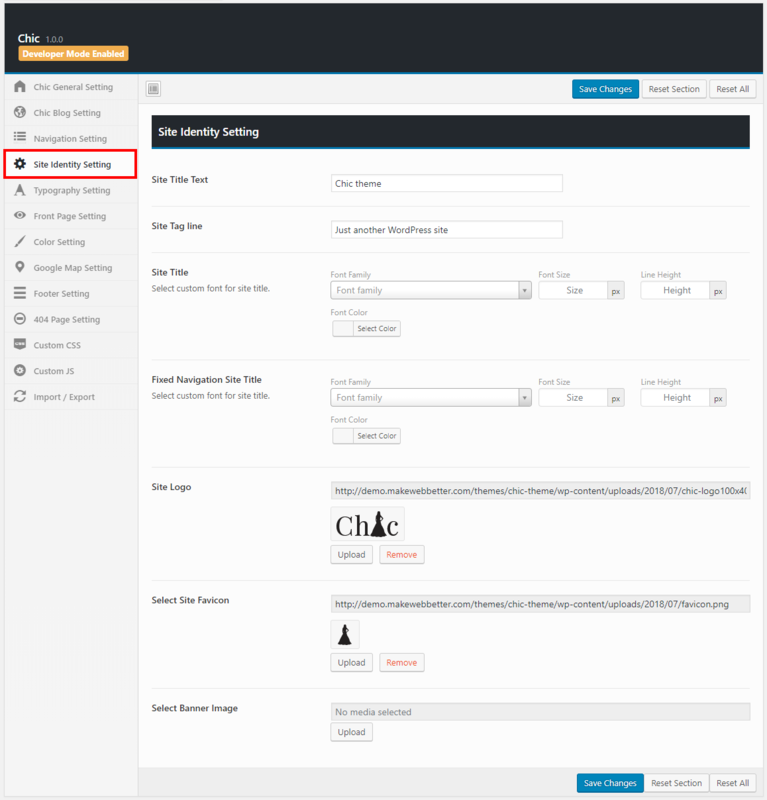 Upload the chic.zip folder to the /wp-content/themes/ directory. 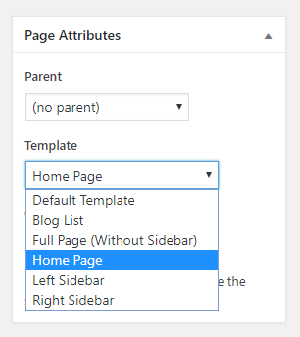 Default Template: Here the default template section you can set the page as default. 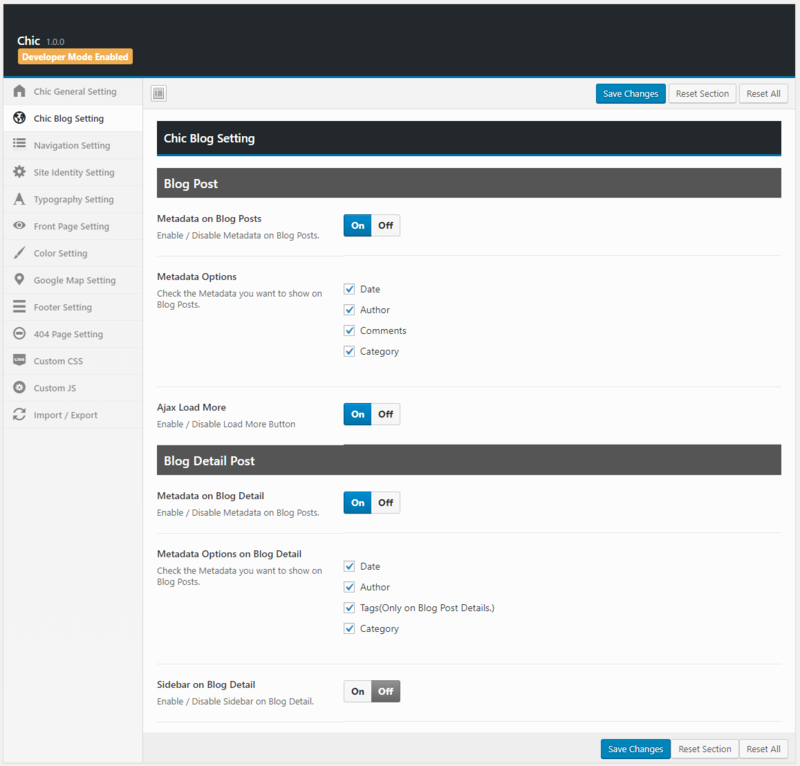 Blog List: Here you can set your page as blog list. Full Page without Sidebar: Here you can give the full length of your page without sidebar. Home Page: Here you can set your page as the home page. Left Sidebar: Here set your page as the Left Sidebar. Right Sidebar: Here set your page as the Right Sidebar. 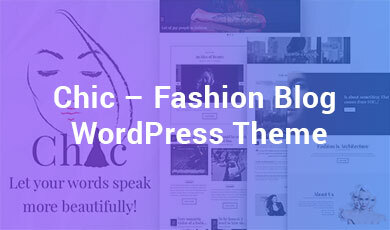 Chic supports 4 WordPress native post formats. set the post featured image for all post. 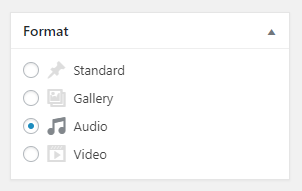 Input the URL or you can upload your audio, video, gallery and so on from adding media. Add Post for Slider: Here you can add your Post as the front page slider. Inverted Slider: For this option, you can set your content on the image. Add Post for exclusive: Here you can select your post as exclusive Post. Add Post for Featured: Here you can set your post as featured. Enable Sidebar: You can enable/disable sidebar globally form the front page. Sidebar Options: You can choose the sidebar as left or right. Global Page Comments: You can set the global page comment. Back to Bottom: We provide back to the bottom button, you can enable/disable this button. 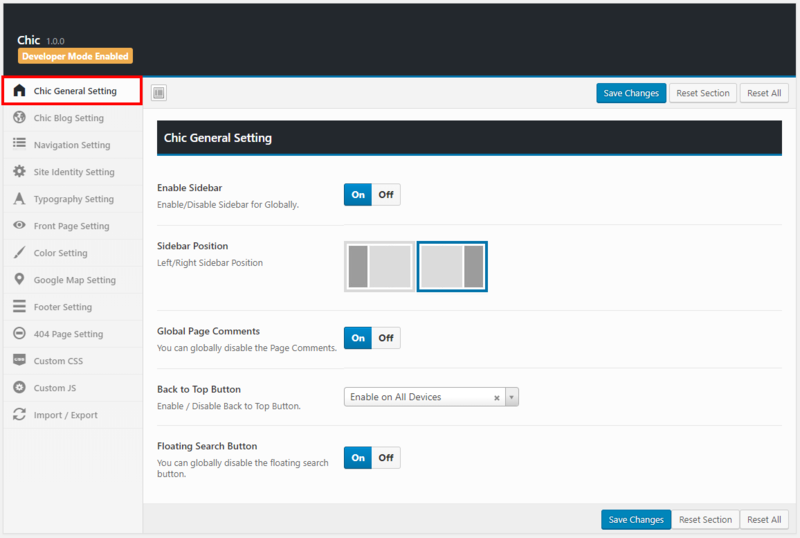 Floating Search Button: You can enable/disable the floating search button globally. 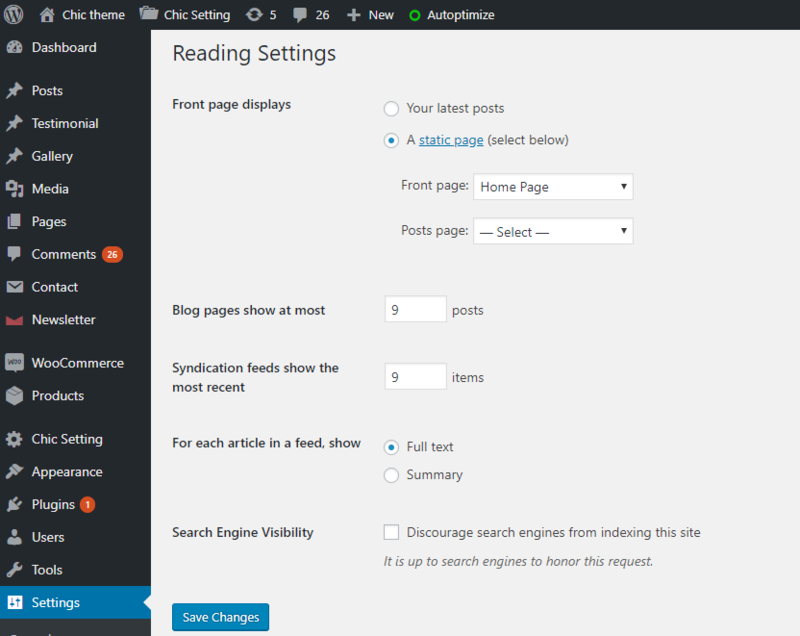 Metadata on Blog Posts: Here you can enable/ disable the access of Blog posts. Metadata Options: You can select/reject the option of metadata option like date, author, comments, and category. Ajax Load More: Here you can enable/disable the more loading of the blogs. Metadata on Blog Detail: You can enable/ disable the access of Blog posts detail. Metadata Options on Blog Detail: You can select/reject the option of metadata on blogs detail like date, author, tags, and category. Sidebar on Blog Detail: You can also enable/disable sidebar of the blogs. Fixed Header: You can enable/disable fix header on the top. if you enable the Fixed Header setting, the header will be fixed on the top. Navigation Link Color: You can set the color of the link on the regular basis or on the time of mouse hover. Navigation Background Color: You can set the top navigation background color. Fixed Navigation Background Color: You can change the navigation bar background color after fixing. Fixed Navigation Link Color: You can give the color for the fixed top navigation link. Active Link Background color: You can give the background color of the link. Active Link Color: you can also choose the color of the link. 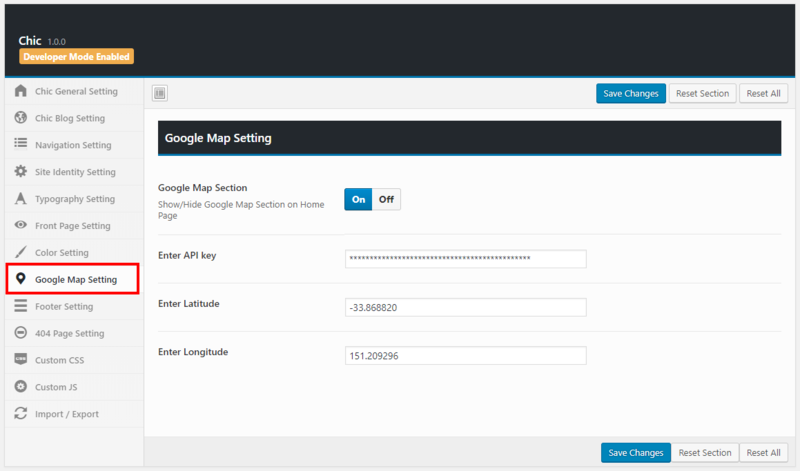 Fixed Navigation Active Link Background Color: you can choose the background color for the fixed navigator link. Fixed Navigation Link Color: you can also choose the color for the fixed navigator link. Set the basic identity of the theme here like. Site Title Text: Here you can easily set the site title text. 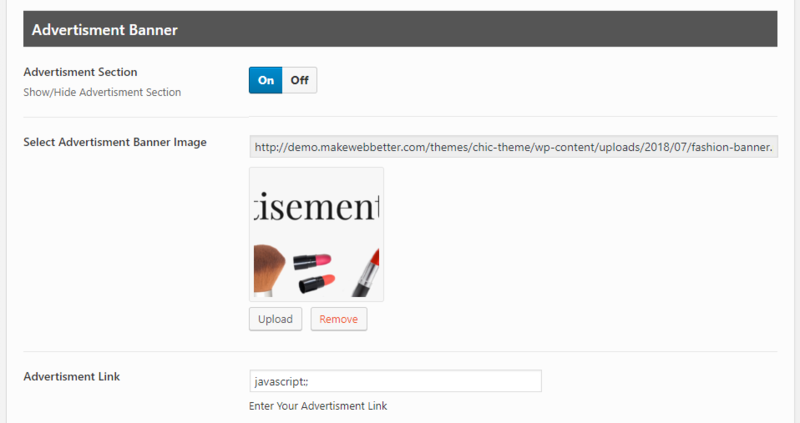 Site Tag Line: You can also change the tagline of the theme simply. Site Title: You can give the site title here and also change the physical property of title like font family, font size, font height, color. Fixed Navigation Site Title: Here you can set the Navigation site title here and also change the color, size, font, and font family of the text. Site Logo: you can upload site logo here. Site Favicon: you can upload the Favicon here. It is displayed on the website URL. Banner Image: you can easily upload the banner image of the theme. Body: you can custom font for the body content here you can choose the font family, font size, Line height, Text Align. Headings: for the heading, you can choose the Font Family, Font Weight, Font Style, Text Align, Font size. You can change the front page sections and its design here like. Fashion Quotes Section: You can enable/disable this section, give the main heading, subheading, content of the Quotes and link to read more. About Us Section: You can enable/disable this section, give the main heading, subheading, images of the about us and give the link to read more. 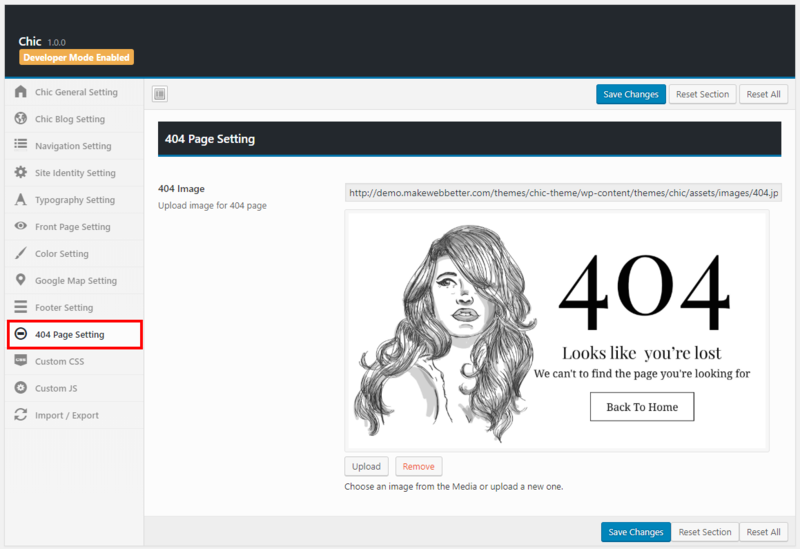 Advertisement Banner: You can enable/disable this section, give images and link to the advertisement Banner. 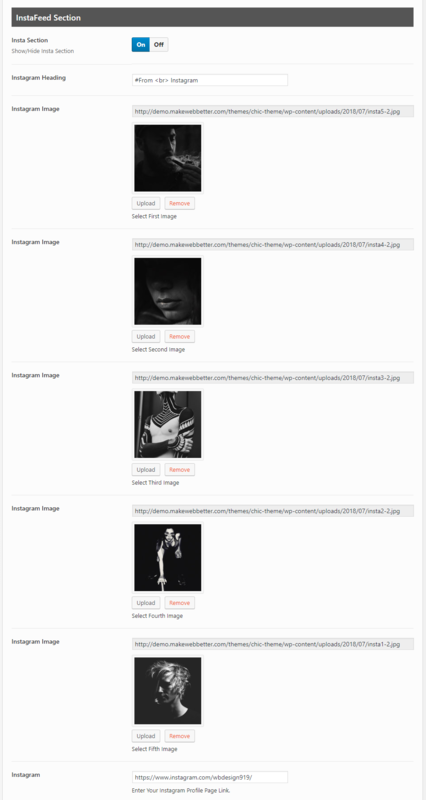 Gallery Section: You can enable/disable this section, give the heading and subheading to the Gallery Section. Article Section: You can enable/disable this section, give heading and subheading of the Article Section. Our Partner Section: You can enable/disable this section and add the new brand logo for partner Section by click on the Add/Edit Gallery button. InstaFeed Section: You can enable/disable this section and add headings and upload images for the InstaFeed. Contact Us Section: You can enable/disable this section, add the headings and give the shortcode for Contact7. Newsletter Section: You can enable/disable this section, add the headings and subheading for the newsletter. Here you can set the background image or background color of the theme and also give the primary and secondary text color. Footer Text Color: you can change the Font Family, Font Size, Line Height, Font Color for the footer text. 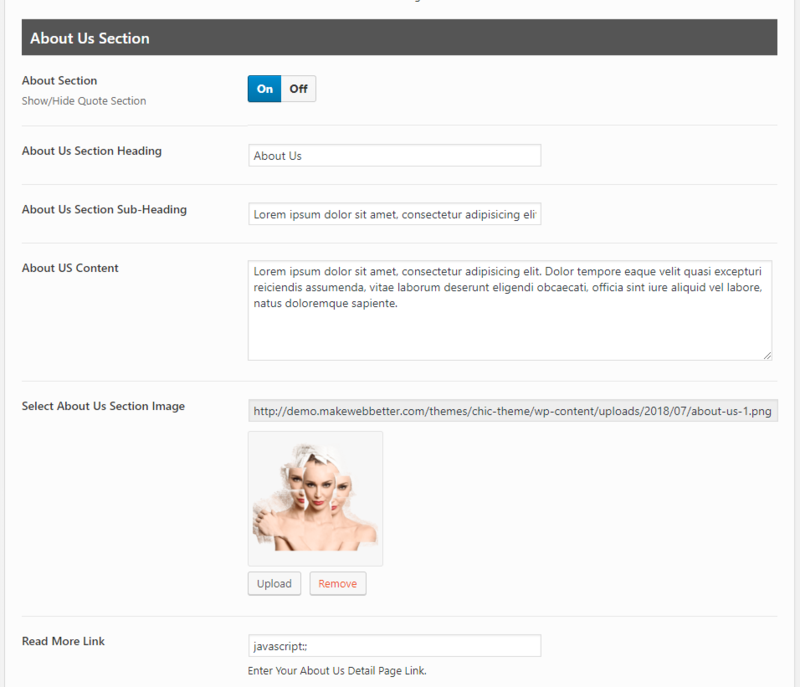 Footer Widget Background: You can set position, Size, Attachment of the widgets and add new widgets. Footer Copyright Section Background Color: Change the background color for the copyright section. 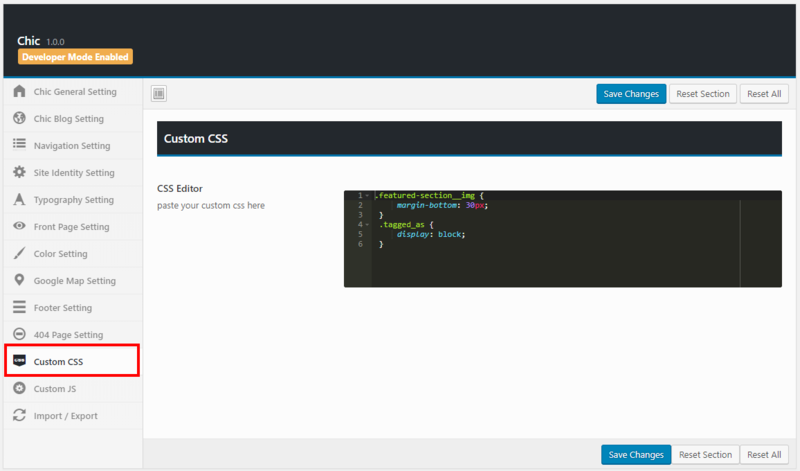 Footer Text Editor: you can add footer text editor. You can upload the image for 404 page. i) About Me Widget: This widget is used to display About the User, the widget includes About image and About description. ii) Most Popular Post: This widget is used to display the most popular post. iii) Recent Post: This widget is used to display the most recent post. 2) Newsletter Widget: This sidebar is used to display Newsletter widget in the footer in Homepage. 3) First Footer Widget Area: This widget display in the footer like a first column of the footer named Information. 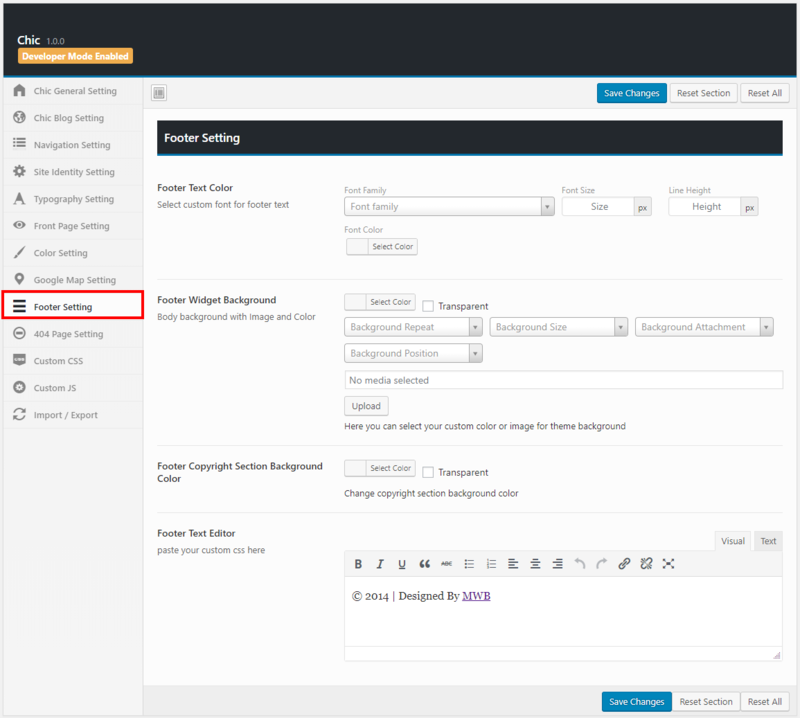 4) Second Footer Widget Area: This widget display in the footer like a second column of the footer named Services. 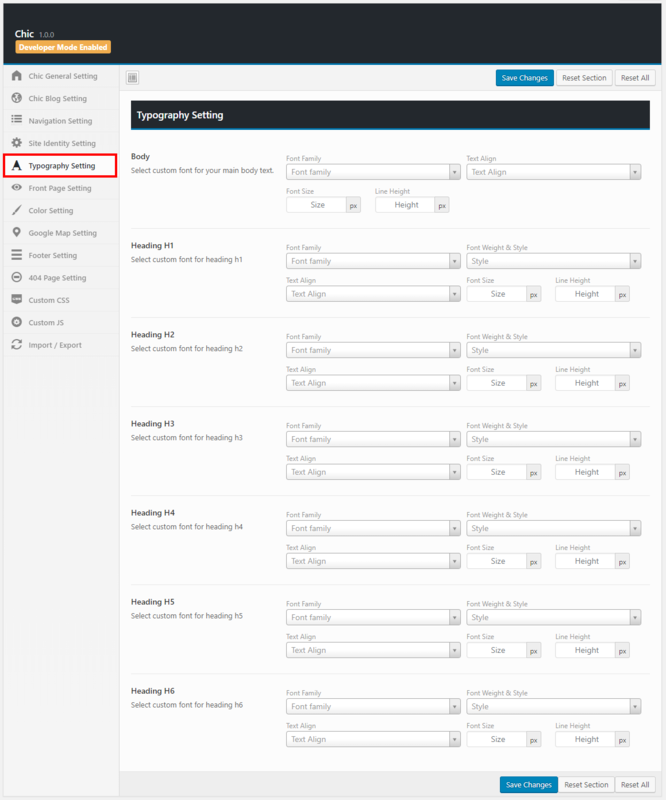 5) Third Footer Widget Area: This widget display in the footer like a third column of the footer named Company. 6) Fourth Footer Widget Area: This widget display in the footer like a fourth column of the footer named About me. 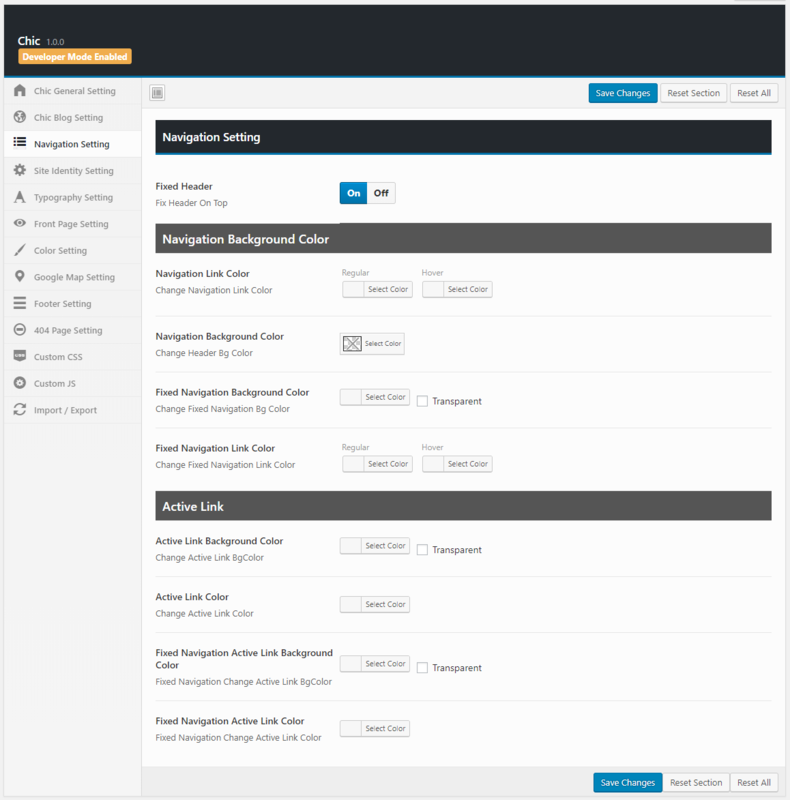 These footer widgets(First Footer Widget Area, Second Footer Widget Area, Second Footer Widget Area, Fourth Footer Widget Area) arrange in the sequence. Here you can write your own JS for the theme.